Derry defended superbly in the last few minutes to secure a one-point win over Cavan in Saturday night's Division Two clash at Breffni Park. Cailean O'Boyle palmed into the net right at the start of the second half to give Derry the lead. Cavan fought back and, buoyed by a goal by Michael Argue, edged into a 1-9 to 1-8 lead through a Ciam Mackey point. Three points by Mark Lynch and one from Shane Heavron proved enough to see Derry achieve the narrow victory. 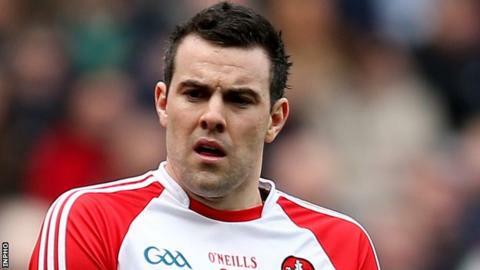 Derry, having beaten Fermanagh on the opening weekend are top of Division Two with the maximum four points, while for Cavan it was a second defeat of the campaign. Cavan held a slender 0-6 to 0-5 interval advantage although Derry would have been in front if Ryan Bell had been able to convert a penalty instead of shooting weakly at keeper Raymond Galligan. Eugene Keating and Gearoid McKernan landed two points each for Cavan whose other scores in the first half came from Dara McVeety, Paul O'Connor and Tomas Corr. Glen clubman Ciaran McFaul scored twice for Derry and their other points before the break were provided by corner half-back Mark Craig, a James Kielt free and Emmett Bradley. Having trailed at the interval, O'Boyle's goal and another score by Kielt quickly had the Oak Leafers three points up. Cavan, desperate to get off the mark in the league on their own ground, fought back and levelled with substitute Argue hammered the ball into the net. It was nip and tuck right up to the end, with Derry blocking a string of Cavan attempts in stoppage time.